This Instant Pot Lentil Soup recipe is perfect for an easy lunch or comforting dinner, and it’s full of vegetables and flavor. Instant Pot-cooking can make meal preparation in general so easy and fast. I also learned that if you pressure cook lentils or beans, you get the added benefit of having the lectins greatly reduced as compared with regular stove-top cooking. Learn more about that in this article. Not having to pre-soak the lentils means that you can make this Instant Pot Lentil Soup in 30 minutes or less. You’ll need a few veggies to cook with the lentils, including a carrot, celery, zucchini, and about 1/2 of an onion (not pictured). You should rinse your lentils before you add them to the pot, and then just chop your veggies and toss them in. As with any Instant Pot recipe, you need at least 1 cup of liquid. I used 2 1/2 cups of bone broth since I was making a soup. Lock on the lid to your pot, and cook for 15 minutes. You can either do the quick-release or natural release at the end of the cooking time. Lunch or dinner is served! What is the benefit of using a pressure cooker versus the slow-cooker? The lectins in the lentils will be reduced, and the whole dish will cook much, much faster! Is this recipe vegan? Just be sure to use vegetable broth and this recipe will be vegan. Aren’t pressure cookers dangerous? Can’t they explode? The new electric versions are very safe. Just be sure to follow the directions about the seal and using at least one cup of liquid. 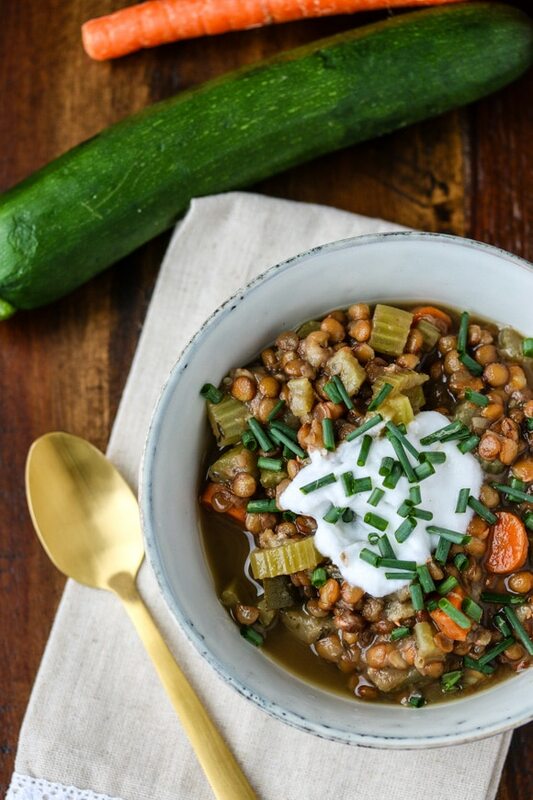 A quick and easy lentil soup full of vegetables and flavor. Combine the lentils, chopped carrots, chopped zucchini, chopped celery, broth, dried oregano, and dried thyme in the pot of a 6- or 8-quart pressure cooker. Lock on the lid and set to cook for 15 minutes. Once the soup is done cooking, release the pressure using the quick-release, or let it come down naturally. 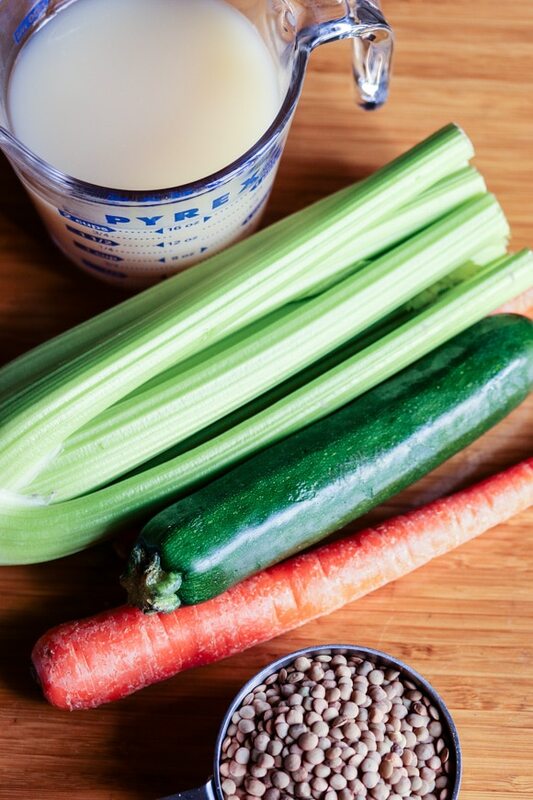 Top each serving of soup with a spoonful of dairy-free yogurt. Finally, sprinkle the top with chopped fresh chives, if desired. 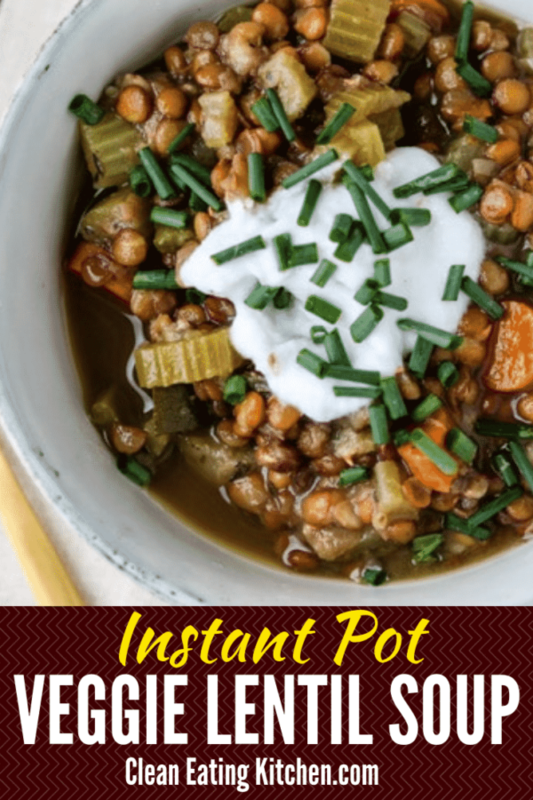 Pin this Instant Pot Lentil Soup to your favorite Pinterest board! By ‘cold weather’ do you mean that the temps finally dropped below 70 degrees? I sure do miss California winters. Oh I’m so loving soups and stews in this chilly weather right now. I still haven’t broke down and got an Instant Pot – I really need to do that. Everything is better with bacon added in! I’m going to have to give this a shot as soon as I pick up an Instant Pot. Instant pot recipes are my favorite and this soup looks so comforting and nutritious. I love that lentils are so quick and easy to cook. Add to that the Instant Pot, and this soup is a real winner! So yummy and cozy for a soup! Lentils bring such heartiness in a soup, allowing us to eat a ton of vegetables without missing the meat. Looks so cozy and comforting! Love all the addition of veggies. My family grows lentils…so they have been a regular in our meals since I was a kiddo!! This sou looks lovely! Sounds comforting! I love how easy the Instant Pot makes beans and lentils! Pure comfort!! I absolutely LOVE lentil soup! I am a big fan of lentils! What a beautiful meal! You get cold weather in California?? I know that may be a silly question…but coming from a Canadian we HAVE cold. 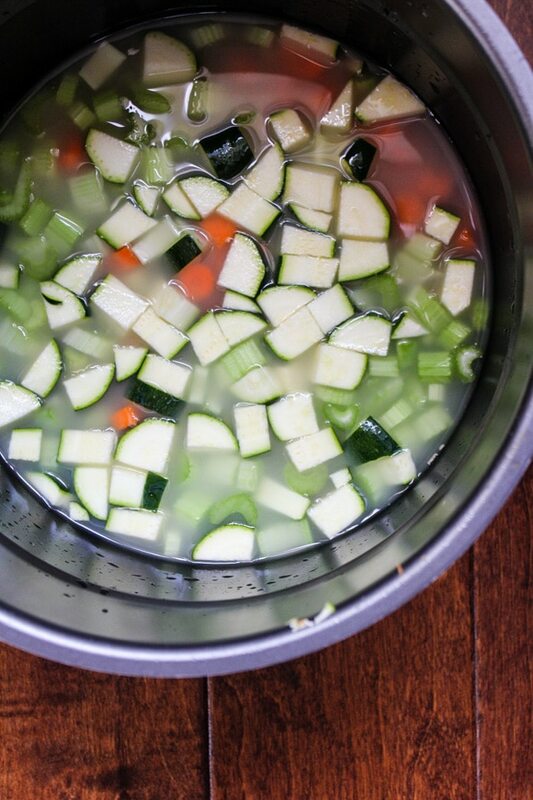 As for soup….well I can eat it in most weather….except for in the high 80’s. This sounds delicious. I have a regular stove top pressure cooker. I will have to give this a try. We certainly have a few more weeks of cold weather here (unfortunately). This looks like a perfect lentil veg soup. And you have reminded me again just how badly I want and Instant Pot! I am a sucker for soup!!! I think it just reminds me of being a child and big bowls of soup and homemade bread at my grans house. It never looked the prettiest but it was always delicious. I have to say yours looks delicious, so I bet it tastes amazing!!! And the idea of sprinkling over crunchy bacon….heaven!!! We’ve had a weird Winter too. This soup looks so hearty! Perfect for a chilly evening! Ooh I’d definitely sprinkle the bacon over this one. Looks SO good, a hug in a bowl! This looks delicious and very comforting – perfect for cooler weather, but honestly, I welcome a cozy meal like this nearly any time of year! Pinning for an idea once I finally get my Instant Pot in a few months! I love how simple this recipe is. Home cooking in the Insta-Pot and having a big bowl of delicious soup, sounds great to me! Mmmm, love that bone broth and bacon! Lovely! I LOVE lentil soup, especially with a great piece of bread! This looks absolutely amazing, and I love that you used the Instant Pot for it to make it so much faster since lentils can take a while to cook. Yum! 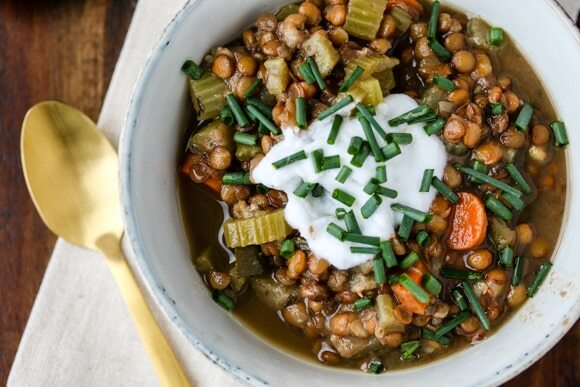 This looks like a really hearty lentil soup! I can relate to the cold weather as we have had one of the snowiest winters I can remember. Great recipe! Can’t wait to try it! 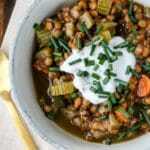 I love a hearty, satisfying lentil soup, and this recipe looks like it fits the bill perfectly! I’m going to have to make this in my Instant Pot tomorrow when we get (what I hope will be) the last of this year’s snow! Ok, I’m so happy to learn about the lectin reduction using the Instant Pot – I really do love lentils but don’t eat them too much, so I’m super excited to learn that! This soup is on my to-make list! Thanks! We must have gotten your weather up here in Oregon because it was 65F and sunny today! Don’t worry, I hear we’re heading for cooler, wetter weather soon. Good thing I’ll have this hearty looking soup to keep me warm! I love my Instant Pot (notice the capitals – that’s how much, it’s like a person to me) Your lentil soup looks so delicious!!! Love the chunkiness of it! Perfect year round, as I love soup!! I have a question for you. Can you please write the post using Indian foods. Thanks in advance will be waiting for your post.